Opening day for the G Line is Friday, April 26! The G line will bring faster, more frequent service to Denver, Arvada and Wheat Ridge, offering greater connections to more destinations. Travel between Arvada and Union Station will take just 20 minutes! RTD will be hosting festivities. Rail service will be free on the G Line all day. 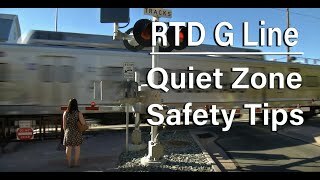 For details regarding the RTD hosted celebrations, visit the RTD G Line website. The Grand Opening Party will take place throughout Olde Town Arvada on Saturday, April 27, from 10 a.m. to 6 p.m.! Rail service on the entire system will be free all day! This historic event will feature live musical performances, entertainment, kids activities and much more. The businesses of Olde Town will feature specials, entertainment and more! G Line ambassadors will be available for information and directions. For Grand Opening Party details, visit Oldetownearvada.org. Parking in the Hub is now a shared space for RTD passengers and visitors to Olde Town and registering your vehicle will be required. The lower levels are for RTD parking and the upper levels are for Olde Town parking. For information about where to park and how to register your vehicle, visit arvada.org/parking-in-olde-town. Everything you need to know about riding the G Line including fares, schedules, stations, timing and more can be found on the RTD G Line webpage. Passenger drop off and pick up is available on the south side of Grandview at Webster Street. Look for signage marked Loading/Unloading. The commuter rail will open with quiet zones in place along the entirety of the line, although horns will continue to be used in emergency situations; if maintenance workers, pedestrians or vehicles are on or near the tracks; if there are issues with gate timing at any of the G Line’s 16 crossings; or if a train must use automatic train control. The G Line is part of RTD’s 2004 voter-approved FasTracks plan to expand transit across the Denver metro region Read the 2016 RTD FasTracks Fact Sheet (PDF) and is part of a larger project called the Eagle P3 project which includes the East Corridor transit line to Denver International Airport. The G Line is an 11.2-mile electric commuter rail transit line that will connect Denver Union Station to Wheat Ridge, passing through northwest Denver, Adams County and Arvada. There are eight stations: Denver Union Station, 41st/Fox, Pecos, Federal, Gold Strike, Olde Town Arvada, Arvada Ridge and Ward Road. For additional information, please contact RTD at 303-299-6000 or visit www.rtd-denver.com.